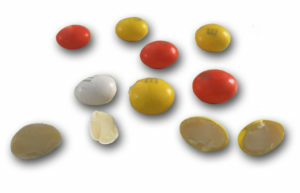 Home » 5 Freshest » #DidYouKnow there are Candy Corn flavored M&Ms? 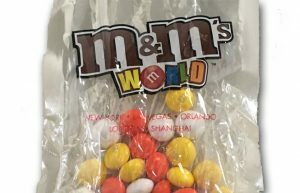 That crappy picture of them above in a wrinkled plastic bag is what I got at M&Ms World Las Vegas because these Candy Corn flavored M&Ms don’t come in a “real” package. Actually – they do online but I’ve never seen these in stores. At M&Ms World, these were in bulk only. Kinda feel like I’m not really doing my job as a Guru because I didn’t know that Mars (M&M makers) made a slew of M&M flavors that weren’t plain and peanut-ish. (Yes, pretzel filled and ‘crispy’ I knew about.) M&Ms World also had a coffee nut flavor, a chili flavor and a few others… Surprised if not slightly impressed. I haven’t seen any of these in retail stores but they’re def online. Now I love me some M&Ms, Peanut and Peanut Butter M&Ms are both top 10 candies for me. Always good. Always reliable. I also like Candy Corn, not many folks do. so I was kinda excited to try these babies. That’s white chocolate in the center. Novel. Not necessarily good though as I’m not a big fan of white chocolate. The size of the M&M is the same as the peanut butter filled one. Good size. To me it just tastes sweet. Kinda fruity. I don’t taste candy corn at all. Good for those of you who don’t like Candy Corn…but then why would you buy these? And for those who DO like candy corn, that’s a big miss. Tell you what, my mini guru said they taste like birthday cake and she’s right on. These taste like birthday cake ice cream and birthday cake flavored Oreos. Neato. As I eat more of these, I don’t dislike them – but they’re not what I expected and I simply can’t figure why I’d ever buy these over the other M&Ms we all know are great. I wouldn’t. Review over. I bought a jumbo-sized bag of these on-sale long after Halloween last year. They were just awful.